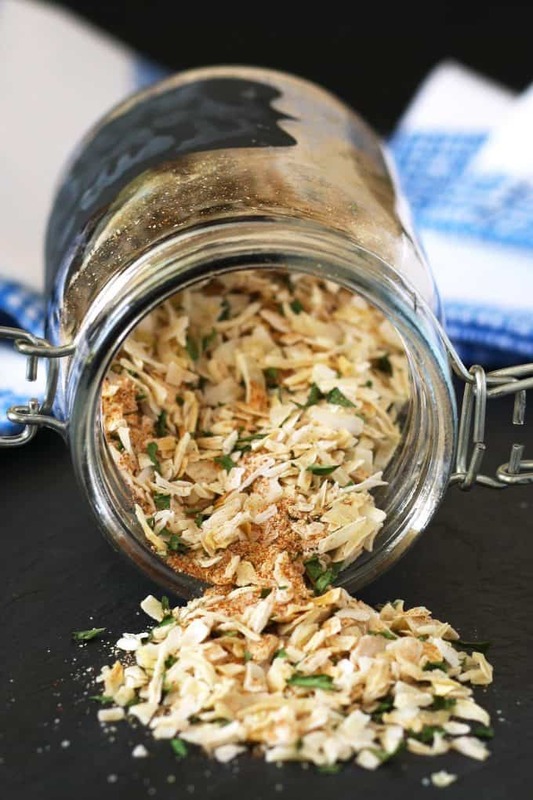 This homemade onion soup mix is the perfect replacement for store-bought packaged mix. Store your mix in an airtight container for several months. A few weeks ago, I shared my recipe for slow cooker pot roast. Outside of the beef, the main ingredient is dry onion soup mix. 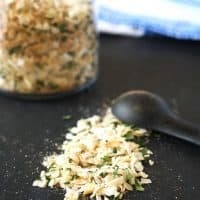 I used to buy the onion soup mix you can get at the grocery store – you know which one I’m talking about. The square packet in the soup aisle. And then I looked at the ingredient list and kind of freaked out a little bit. I need to stop looking at ingredient lists or I’m never going to be able to go into a grocery store again. Chemical after chemical, or at least a bunch of scientific names I couldn’t possibly know the meaning of. Not really my cup of tea right now. Or in this case, my cup of soup. I didn’t want to use any beef bouillon, which you will see in several other homemade onion soup mix recipes. There were a few reasons behind that. I came up with this recipe instead. Its perfectly onion-y pungent and is really good with my pot roast. 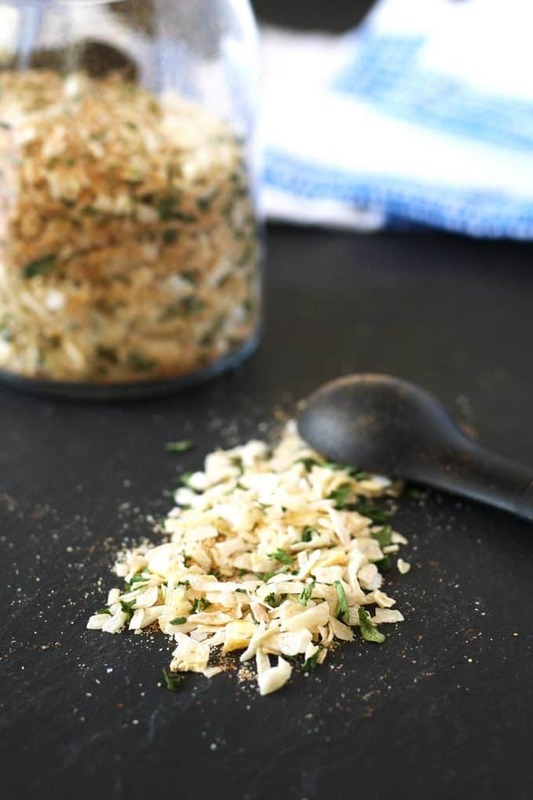 Store your soup mix in a sealable container for up to 2 months. 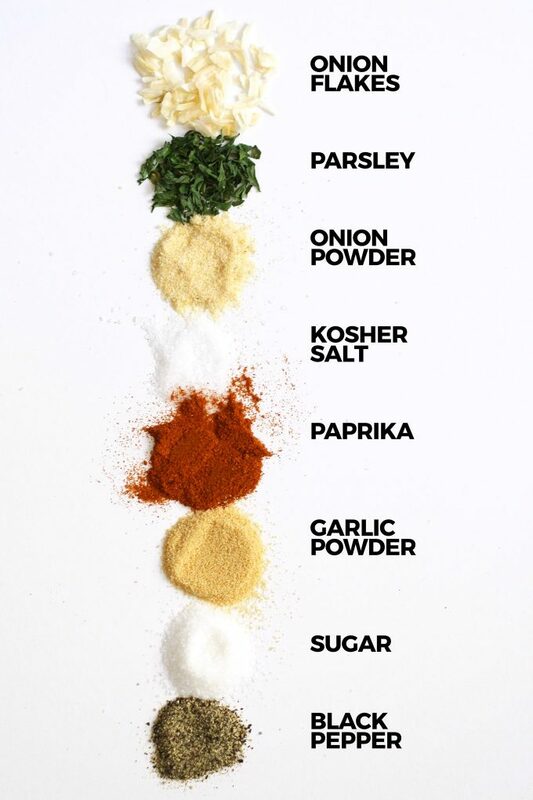 Make sure you give it a good shake before you measure because the smaller spice parts sink to the bottom. If you are using this recipe to replace a store-bought package, you will need 5 tablespoons of it. Once you have mixed up your soup mix, you can use it to make soup, slow cooker pot roast or onion dip. 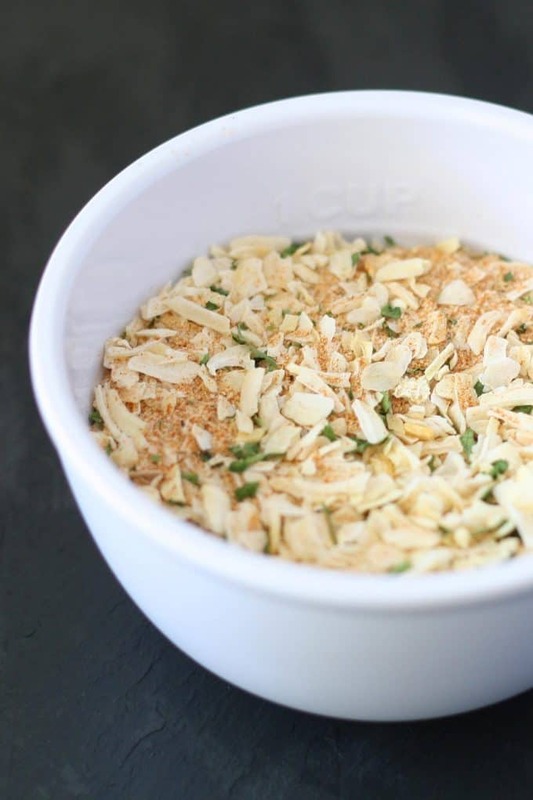 If using this is as a replacement for a package, use 5 tablespoons of this easy-to-make mix. This is great! Thank you for sharing the recipe. I can’t wait to try this. Thank you for sharing this recipe and I love that it is vegan. Now I can make my own! Thanks for sharing this recipe! I hate buying the little packets with so many mystery ingredients. how many tsps. of this to how much water if you want to make a bowl of soup for one person? Sophie, I usually use this to make pot roast or onion dip, and haven’t used it to make soup. That being said, I would suggest 2 1/2 teaspoons of this mix for every cup of water. Thank you so much for this recipe! I started to make a meatloaf and realized I was out of the store bought stuff. Thankfully I had all the ingredients on hand to make the recipe!! Thanks again! I have a recipe from my partner’s mother which is a mushroom rice dish you make in the oven, super easy but I wanted to avoid the packaging and reduce the salt and added preservatives, so I’m definitely going to try this! Thank you! I can get all these ingredients at my bulk store. Do you think this would still be tasty minus the sugar? My family has taken sugar out of our diet but I have an amazing recipe for Salisbury steak I’ve been dying to make again. ???? I made meatloaf, and omitted the sugar, also the tomatoes, for that matter. On a restricted diet. It was great! Thanks for the recipe. Intend to keep it on handforever! Thank you for this recipe. I can’t wait to try it. Do you think this would be good to use for Spinach Dip? I am a Celiac, and they just changed the Knorr dip ingredients and now it isn’t gluten free. Ugh. I’d love to use this as a substitute if you think it would work. I think it would delicious in spinach dip – please let me know if you like it! Hello! I’ve just come across this and I’m very excited to try it out! I did have one question for you though. In the nutritional information area it says it’s 76 calories per serving but it doesn’t say how much a serving is. Is it the whole quantity of mix or a smaller amount? Hi Jessica. The nutritional information is automatically calculated by an app and then I have to manually calculate and fix it. I am working my way through all of the recipes slowly. Unfortunately, I have not gotten to this one yet but I will put it at the top of my list.